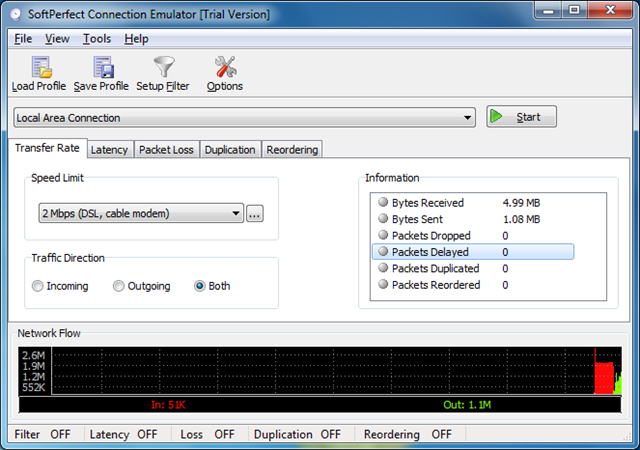 Today’s ToolTip is about SoftPerfect Connection Emulator SCE. As the name says the software allows you to emulate different connection types. Unfortunately the tool is not for free, but I found the software nice enough to give it a try and eventually buy it especially since I haven’t been able to find a free alternative yet. SCE allows you to simulate different network speeds such as modem, ISDN or DSL. You can either choose one of the predefined speed settings or configure your own. Furthermore you can configure the Latency and Packet loss rates. I tested SCE by configuring various network speeds and then used Speedtest.net to check the results and they were very accurate.